On 20 October 2018, the GR – Ljubljana Exhibition and Convention Centre officially opened the original exhibition of real human bodies, the BODY WORLDS Vital. The original exhibition of real human bodies, on display at the GR – Ljubljana Exhibition and Convention Centre until 20 January 2019, has been in the last two decades seen by 47 million visitors globally. The exhibition, honouring the potential of the human body and the body in motion, educates visitors about human health, wellness, and disease. BODY WORLDS Vital is for anyone visiting or meeting in Ljubljana between 20 October 2018 and 20 January 2019, an opportunity to explore the mysteries of the human form. With a focus on preventative health management, this world-renowned exhibition intends to strengthen one’s sense of health, show the potential and limits of the body, and raise the question of the meaning of life. Each BODY WORLDS exhibition contains real human specimens, including a series of fascinating whole-body plastinates as well as individual organs, organ configurations, blood vessels and transparent body slices. It provides wide-ranging insight into the anatomy and physiology of the human body. In addition to organ functions, common diseases as well as long-term impact of addictions, such as tobacco or alcohol consumption, are described and demonstrated with comparison between healthy and affected organs. Of course, the question arises: WHOSE are these bodies? The answer is simple: they are donated by people who declared during their lifetime that their bodies should be made available after their deaths for the training for physicians and the instruction of laypersons. This way the donors expressed their wish to be useful to others even after their death. And another question surely arising is: how are the bodies prepared? They are plastinated. 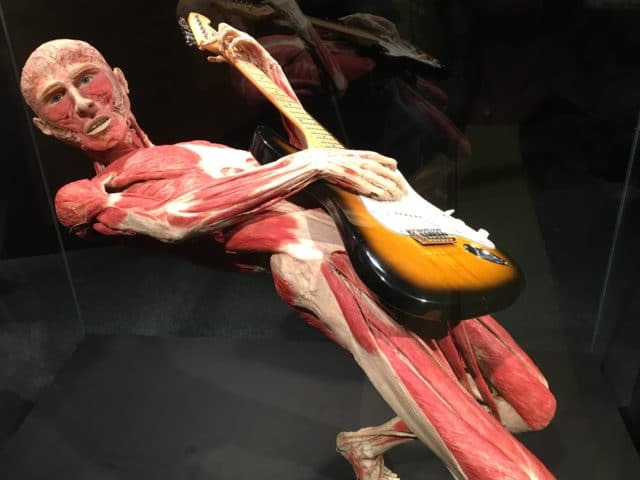 In 1977, Dr. Gunther von Hagens invented the process of plastination which preserves bodies and produces solid, odourless, and durable anatomical specimens for scientific and medical training. The production of a human whole body plastinate requires approximately 1,500 working hours. Any congress guest, thus, coming to meetings in Ljubljana in the next three months, should visit the GR – Ljubljana Exhibition and Convention Centre and its Stebrna Hall, and take a look at this world-renowned exhibition with a duration typically between 60 and 90 minutes. In addition, the audio guide will provide them with stats, facts, and further explanations as well as practical tips on how to keep the body healthy and functional as long as possible. The exhibition is open seven days a week (including holidays), between 9am and 8pm. See more: http://www.body-vital.si/en/.